Investment in agri-food innovation is key while food prices continue to climb. That’s what Michael Detlefsen, President of Global Ceres Ag Corporation, says in an interview for The Business News Network’s After Hours program. Detlefson was part of a panel of experts discussing global rising food prices at an event at MaRS last month. 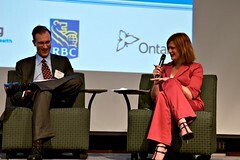 BNN’s Kim Parlee moderated the event and then interviewed Michael Detlefsen asking him more questions about the agricultural economics and opportunities. In the interview, Detlefsen talks about the supply and demand factors that are causing food prices to rise. He also discusses the agri-food innovation investment opportunities within the private sector. According to Detlefsen, some of the more promising investment opportunities lay upstream in the supply chain, in areas such as crop inputs, agricultural distribution centres and crop seed technology. He also notes that approximately 75% of investment opportunities in Canada are held privately, indicating that companies need to continue producing and investing in agri-food innovation during this inflationary period. Click on the link to watch the July 23rd episode of After Hours, and cue up to the 39th minute of the program to see the interview. With investment comes the need for innovation, and agri-food innovation is the way of the future, it seems. If you’re based in Ontario and looking for some inspiration, you’ll want to check out the “Journey To Your Good Health” and “Agri-Food Innovation” pavilions at The Royal Agricultural Winter Fair (Nov 7th – 16th in Toronto). You’ll find presentations and interactive displays showcasing food, nutrition and innovations in agriculture – all of which potentially address this food crisis. Drop by to meet the folks at MaRS Landing, as we help commercialize agriculture and food innovation. Funded in part by Agriculture and Agri-Food Canada and the Ontario Ministry of Agriculture, Food and Rural Affairs, MaRS Landing strives to make Canada’s agricultural sector a world leader in science and innovation by providing information, access to services and connections between agriculture, food and human health.